Watching your child's development is one of the joys of parenthood. Children just assume that the way they see things, is just the same as everybody else. If the pages in a book or the board at school seem a bit of a blur, or reading is really tiring, they think it's that way for everyone. 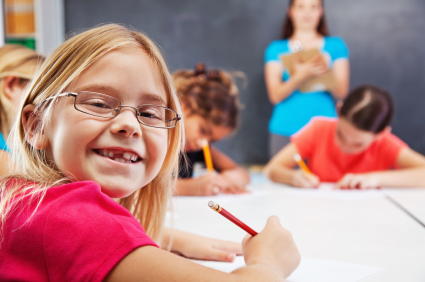 Poor vision or poor visual skills can affect a child's development in many ways. It can make learning more difficult, it can make the child clumsy and un-coordinated and it can even affect the child's personality development. Our optometrists as parents understand just how important your child is. There are many visual skills needed for complete vision development, starting from birth to age 7. Then as they grow through into puberty there are further vision changes which can affect both school work and myopia development and progression can affect their adult eye health risks. Your child's vision is precious and we want to help them be the best they can be. So a child's visit to CapitalEyes is different to elsewhere. We are looking to see if the visual skills are being learned, if they have clear and sharp vision but also accurate focusing and a high degree of co-ordinated activity of both eyes. Once clear vision is developed, then the child's more advanced visual skills are assessed by our optometrists. These checks include the ability to change focus, fix and converge the eyes (aiming the eyes), eye tracking and saccadic ability (eye movements) and also depth perception (important for sport). Assessing a child's vision is much more than just reading a letter chart, and if your child does require glasses, regular review appointments to followup are very important to ensure that their vision development is optimised. Eyecare and vision is more than just buying a pair of glasses. When your child's vision is so important, why would you have a free quick check when the underlying reality that it's free because selling glasses collects the payment? Yes, we do charge consultation fees at CapitalEyes, but we don't recommend glasses lightly for children.